With the thought of liberating Transylvania, Romania had found itself on August 27, 1916 in the tactical nightmare of waging a war on two fronts. While its armies advanced into Transylvania without encountering any major resistance, the same thing would not be happening at the border with Bulgaria. On the contrary. The Northern Army, the Second Army and the Romanian First Army attacked along the Carpathians and entered Transylvania, while the Third Romanian Army, commanded at the time by General Mihail Aslan, with its 150.000 soldiers, was dispatched to the south of the country. Its mission was to repel a Bulgarian attack, and on M (the mobilization date) +10 days it would go on the offensive in order to neutralize the Central Powers forces in north-eastern Bulgaria and occupy the Ruse-Varna area. It was estimated that enemy troops numbered about 120.000 Bulgarian, German and Turkish soldiers. The plan was largely based on the supposition that most of the Bulgarian forces would be tied down on the Macedonian Front before the Central Powers could actually bring in significant reinforcements. In short, the plan called for a strategic defence in the south, starting from the idea that the majority of Bulgarian troops would be concentrated on the Macedonian Front to repel the expected Allied offensive. The strategy to attack Romania from the south by the Bulgarian, German and Turkish troops was put into practice by the German Field Marshal August von Mackensen, at Falkenhayn’s suggestion, and consisted of two stages. In the first stage, an attack by the Bulgarian-German forces against the Allied army in Thessaloniki would have prevented an offensive action from taking place. The second stage involved the rapid transfer of some German and Bulgarian units from that area to the southern border of Romania followed by a direct attack on Dobruja. The crossing of the Danube and an attack on Bucharest was not planned due to the insufficient number of troops that were available at that time. The main target for the attack was to be Tutrakan, after which the Bulgarian-German forces had to advance further into Dobruja. Tutrakan had been a point of interest in military campaigns since antiquity. Situated at the western extremity of Dobruja, the town was like a thorn in the back of the Bulgarian army. By the Peace Treaty of Bucharest (July 28/ August 10, 1913), Romania obtained Southern Dobruja, a territory delimited by four cities- Rusciuc, Silistra, Șumla, Varna, of which only Silistra came to be a part of Romania. Tutrakan had an important military value, being located only 60 km from Bucharest while also connecting Silistra and Rusciuc. In addition, it was an important junction for two communication routes, one that came from Rusciuc and the other from Razgrad (Tarnovo). Tutrakan was defended by Romanian soldiers placed on two concentric lines of ditches and outposts. There were no permanent fortifications on these lines, but the redoubts had armoured shelters and defensive ditches. But, as Marshal Mackensen would later find out, Tutrakan’s main weakness was not its fortifications, but the Romanian soldiers who defended them, and especially their commanders. The garrison of the fortress was made up of troops from the17th Division, created only a few months before the war, commanded by General Constantin Teodorescu, who was trained at the Vienna Superior School of War and who previously worked as geography professor at a similar institution in Bucharest. He was considered one of the best Romanian military theorists up until the First World War, and his direct superior was General Mihail Aslan, commander of the Third Army, whose headquarters was in Bucharest. The total number of troops available at his command amounted to 17 battalions: 511 officers and 25.086 soldiers. However, the 17th Division had many raw recruits, and the officer corps was inadequate, composed mostly of reserve officers with brief training. The morale was rather low, the garrison troops feeling rather isolated. In the camp of the Central Powers, although Marshal August von Mackensen had different views than those of the Bulgarian Command, he accepted the operations plan drawn up by General Stefan Toshev, the commander of the Bulgarian Third Army. He intended for a simultaneous attack on the Tutrakan and Silistra bridgeheads, with the main strike force concentrated on Tutrakan; afterwards, the Bulgarian-German forces were to advance further into Dobruja, as the crossing of the Danube was not a priority. The offensive on Tutrakan was to be carried out by the 4th Infantry Division, by two brigades from the 1st Infantry Division and by Major Hammerstein’s troops (a German battalion, seven machine gun platoons, three squadrons and two batteries). General Panteley Kiselov, a hero of the Bulgarian-Serbian war of 1885, was in charge of the attack, as he also followed a General Staff training course in France, recommending him to lead this offensive. The numerical superiority was only 1.4 to 1; by concentrating the forces in the main area of ​​the attack (the southern area), a local advantage of 2.25 to 1 was achieved. Unlike the Romanian troops at the bridgehead, the Bulgarian divisions used for the offensive were the best operative units they had and the artillery, which was numerous and modern, was very well supplied. For the picture to be complete, the Third Bulgarian Army had organized an excellent espionage service; by predominantly using the local population, they learned with great precision how the bridgehead defence was organized and the composition of the Romanian forces there. The morale of the Bulgarian soldiers was at an all-time high; The “hour of reckoning” had come. The actual attack on Tutrakan started on September 2, with the main strike coming from the 4th Division in the southern sector. The defence was overwhelmed and the soldiers retreated from their outposts to the main defensive line. In sector 3, resistance was even weaker. 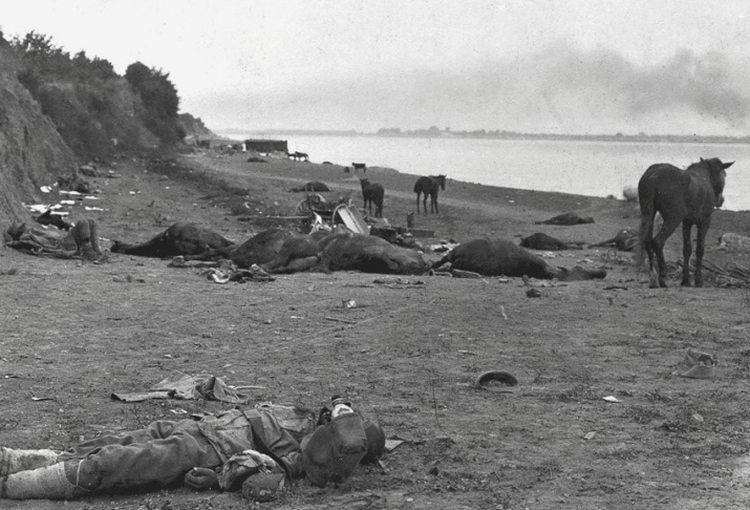 Although they were not directly attacked by the enemy, but only bombed from afar, the Romanian units panicked and left their positions and retreated to the Danube. When they returned to the front, only a part of them reoccupied their positions; the rest remained on the second defensive line, facilitating the advance of the enemy between Silistra and Tutrakan, which meant cutting the connection between the two ends of the bridgehead. The way Romanian reinforcements were used also proved completely unproductive as they were introduced into the battle successively and without minimal familiarization with the land and the operational situation. On the morning of September 5, General Kiselov launched the final assault on Tutrakan. In the southern sector, the Bulgarian soldiers advanced with a “burning zeal”; two regiments advanced singing “Oh, Dobruja, you are our earthly paradise”. The focal point of the attack was in the area between ​​forts 6-9, defended by the 79th Infantry Regiment, which lost three quarters of its troops and was eventually pulled back in reserve on the second defensive line. The Romanians retreated in panic and disorder. The losses suffered by the Romanian troops were significant, with the Bulgarians taking 28.500 prisoners, out of which 480 were officers. The total number of forces that fought at the bridgehead amounted to 39.000 (without the navy). There were 7.000 casualties, dead and injured, while 3500 managed to escape. The 79th Infantry Regiment, which fought in sector 2, lost 76.8% of its troops, which shows that in that sector the resistance of the Romanian forces was fierce. Bulgarian casualties rose to 7.950 dead and injured, 70% of the total being from the 4th Infantry Division.